The list of sub-ohm tanks keeps getting longer. 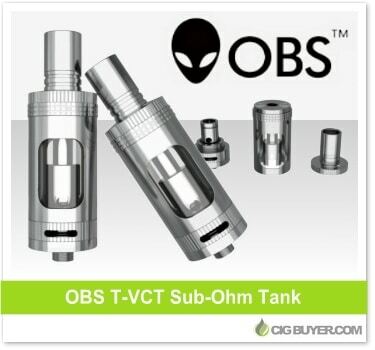 The OBS T-VCT Sub-Ohm Tank is one of the latest options to hit the market, with it’s claim to fame being a huge 6ml tank and unique top fill design. Unlike most sub-ohm tanks, there’s no need to remove it from your device to top it off – just unscrew the drip tip and refill. Like most of it’s competitors, it includes adjustable airflow and the coils are made from 100% organic cotton and U.S. made kanthal wire (0.25 and 0.5 ohms), making it a quality, high performance option.